How To Throw A Vegetarian BBQ has 30+ vegetarian recipes and tips to help you throw your next Vegetarian BBQ! Last weekend, we had a lovely BBQ with some of our closest friends with so delicious food & much needed downtime. Two of our friends are slowly transitioning into vegetarian lifestyle so I volunteered enthusiastically to bring vegetarian dish and make a blog post about it because vegetarian BBQ is totally a thing. I am not vegetarian (or plan on becoming one) but I love plant-based foods equally. While vegetarianism is on the rise, there is still a lot of hesitation and unawareness about plant-based options that are out there. I hope this post on "How To Throw A Vegetarian BBQ" will help you host your vegetarian guests, friends, and families. 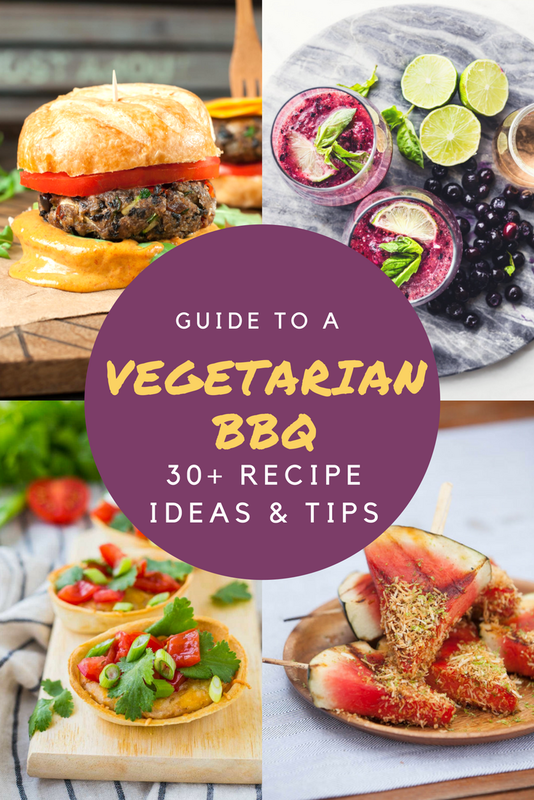 I have complied 30+ recipes to include main dishes, sides, salads, desserts, and drinks + tips to make your next vegetarian BBQ a blast. HAVE A PLAN : This is so obvious but it is a key to have everything go well. Make sure you know give adequate notice, have an idea on how many guests, their diet preferences (and how strictly they observe it), and if it's a potluck vs. a party. If it is a potluck, have a signup sheet or some sort of a system to keep everyone on the same page on who's bringing what. You clearly don't want to end up with 5 bags of chips, 3 salsa, but no plates or cups. With proper planning and knowing your guests, a vegetarian BBQ doesn't have to be all vegetarian either. MIX & MATCH FOOD OPTIONS : A vegetarian BBQ doesn't mean just grilled veggies. There are quite a few options out there for burgers, hot dogs, grilled portobello mushrooms, eggplants, and vegetarian kebabs to name a few. Once the entree is decided, have your sides planned, more variety the better it is! It is best to have sides that can be served at room temperature or cold so it doesn't have to reheated. We had Lightlife Veggie Hot Dogs & P Terry's Vegan Burgers, both were pretty good! **Ask your guests if they are okay or not if it's okay to share the same grill with non-vegetarian items. If not, you can first do the vegetarian ones and keep it warm**. **Store-bought desserts such as brownies and cookies are always a major hit and they withstand heat pretty well**. KNOW YOUR FOOD SAFETY: Bacteria in food multiply faster at temperatures between 40°F and 140°F so be extra careful in warm weather to prevent food borne illnesses. Always wash your hands prior to touching the food, do not cross contaminate meatless food with raw meat esp with knife and chopping board, and eat hot foods hot and cold foods cold. SUPPLIES: Depending on the recipes, make sure you have adequate tongs, spatula, aluminum foil, and supplies for the grill (like gas, charcoal etc). Extra cutting board, knifes, and serving utensils always come handy, trust me. It is always helpful to have separate coolers for food and drinks, adequate ice separately with a scoop please! Paper plates, napkins, plasticware, cups, paper towels, and trash bags. Condiments such as ketchup, mustard, hot sauce, and lemon, and other accompaniments for burger, hot dogs. To-go containers or tupperware for the extra food for guests to take home. 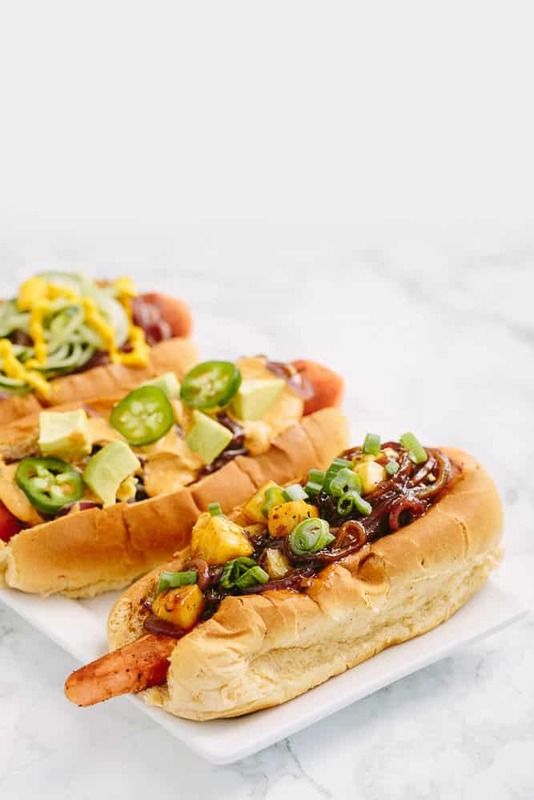 I hope these vegetarian-friendly recipes & tips will help you plan your next BBQ and have a great time with your friends and families this Summer. If you have any other tips or ideas, please let me know so I can add to the list.